Recycling is the process of making new products from already used materials. As a result of recycling dramatic changes in the manufacturing industry have taken place. In addition the process of recycling improves our environment and our quality of life. Unfortunately though, most of us do not know the benefits of recycling and the reasons that we spend time separating our waste from recyclable materials. Thus we do not put in the time and effort required for proper recycling. For example did you know that kettles, computers and mobile phones which are part of our everyday life can be recycled? What other products which we use daily can actually be recycled? What are the benefits of recycling? Here are some interesting fact about recycling to help you understand better the process and its benefits. More than 75% of products which we use in our day to day life can be recycled. Electronic and electrical products, kitchen kettles, paper, aluminum cans, kitchen utensils, torn clothes, kitchen garbage, glass bottles, tires, wood, oil, plastic etc are the most important household products that can be recycled. By recycling electronic products we get back raw materials such as steel and aluminum. Aluminum cans and glass bottles are recycled thus recovering back some or even all of the original raw material. Recycled products which we get after recycling glass and aluminum cans are of equal quality as ones made from new material. Kitchen utensils can be either recycled or reused. We can give used utensils to charity or collect enough weight to make a trip worth to a scrap metal facility. Kitchen garbage can be turned into compost in a properly designed bin and can be used as garden fertilizer. The green house gases emitted as a result of the recycling process are significantly less compared to the GHGs emitted from products made from new materials. The amount of raw materials which we use for producing a new product from recycled material is reduced by 50% saving precious natural resources. By recycling glass bottles we can save energy. The amount of power saved by recycling one glass bottle is enough to run a TV set for more than 15 minutes. The quality of glass obtained from recycling is as good in quality and purity like brand new glass. Average time needed to recycle aluminum can, meaning from recycling reaching store shelves again, is just six weeks. Aluminum recycling saves around 95% of energy needed to manufacture a new aluminum. Glass can take 4000 years to decompose in nature. For every 10,000 tons of waste only 1 job position is created whereas with recycling 36 new jobs are created. 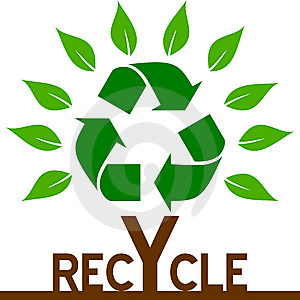 By recycling paper we can save trees, oil, energy and water which are required for its production. For example by recycling one ton of paper we save 7000 gallons of water, 4000 kw/h of electricity, 380 gallons of oil and of course 17 trees that are used as raw material. The average amount of waste produced by a human in a day is about 4 pounds and in a year this is estimated to about 1 to 1.5 ton. This amount can be reduced significantly if we properly recycle. More than 75% waste which we throw away can actually be recycled. Currently we are recycling only 30 % of it. The amount of energy required for recycling plastic is significantly less compared to the energy needed for incineration. Cost required for designing and constructing a recycling paper mill is more than 80% less compared to the cost required to construct a paper mill which manufactures paper from fresh pulp. We can either reuse or recycle electronic products. Most of us are not aware of this so only a small fraction of electronic waste is currently recycled. Recycling electronic products is an environmental friendly process. We can get a valuable raw material by recycling them. The best way for disposing your old car tires and rubber products is by recycling them. We can produce carpet underlay, playground surface and sports shoe soles by recycling them. Recycling is the last step in the 3 R cycle of reduce, reuse and recycle and since the first 2 steps are not usually implemented to a great extend we should at least keep in mind all this interesting recycling facts and do our best in at least in increasing the level of waste we recycle at home.